The Low-Down: Be Careful What You Wish For: Was the Whole Foods Acquisition Amazon's Last Straw? Be Careful What You Wish For: Was the Whole Foods Acquisition Amazon's Last Straw? Was Amazon's Whole Foods acquisition the proverbial bridge too far? Did this finally, perhaps inevitably, galvanize business and consumer unease with the tech behemoth's reach? Despite a business friendly administration in Washington and the search for it's putative, politically advantageous 'second home,' Amazon could begin to reap the consequences of its size and negative economic impact. 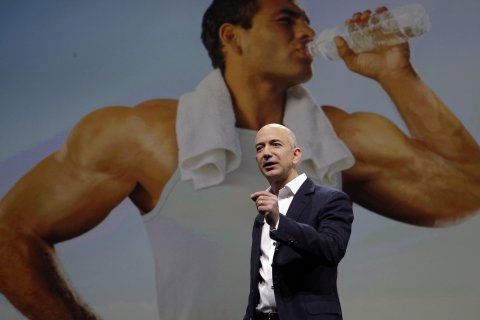 Amazon owner Jeff Bezos owns the not-very-Trump-administration friendly Washington Post so any support the Administration may throw behind Amazon is sure to require changes in the tone of Post coverage. Which Bezos, possessing no small ego himself, may or may not find acceptable. The tech industry loves to talk about small, nimble startups.In reality, the tech game plan today is all about bulking up and getting as big as possible. The big theme in tech this year was consolidation — not in terms of mergers and acquisitions but in the big companies extending their reach and trying to conquer new markets. As we enter 2018, it's clear that either you're against Amazon or you might become part of Amazon. The big theme in tech this year was consolidation — not in terms of mergers and acquisitions but in the big companies extending their reach and trying to conquer new markets. The most important deal of the year, though, was Amazon's $13.7 billion acquisition of Whole Foods. In one swoop, Amazon disrupted groceries, retail delivery, and even the enterprise IT market. Next year will be all about Amazon versus everyone else. The tech industry loves to talk about small, nimble startups. In reality, though, the tech game plan today is all about bulking up and getting as big as possible. Megamergers, such as Broadcom's pending $105 billion acquisition of Qualcomm and Dell's $67 billion purchase of EMC in 2016, underscore the industry's never-ending frenzy to consolidate. And in 2017, the tech giants sought to project their power even further. Facebook built its lead on Snapchat by gradually swiping away the best part of the upstart's app. Apple released a new iPhone designed to conquer augmented reality, the next frontier. Microsoft took swipes at Amazon, Apple, and even startups like Slack. Google doubled down on building its own hardware. To my mind, though, the single biggest and most aggressive move this year was by Amazon, with its $13.7 billion acquisition of Whole Foods. It wasn't a tech deal, in the traditional sense. But it caused ripples that go beyond just groceries — ripples that are slowly turning the entire US economy into a case of Amazon versus everybody else. The first ripples were pretty obvious: Amazon immediately started lowering prices at Whole Foods, increasing pressure on rivals like Kroger to compete amid sliding share prices. Now that Amazon is hinting at more discounts to come for Amazon Prime members, that pressure will only intensify. Then came something a little less expected but more obvious in retrospect. In the wake of the Amazon-Whole Foods deal, megacorps like Target and Walmart hustled to reach deals to let customers shop their wares via Google, which is emerging as Amazon's main rival. Similarly, smaller retailers are approaching startups like Instacart to help give them Amazon-style same-day-delivery options. And then, the Whole Foods acquisition has resulted in shockwaves across the cloud-computing market, where Amazon and its massively profitable Amazon Web Services reign supreme. After Amazon's Whole Foods tie-up, Walmart reportedly issued an ultimatum to its vendors: Quit AWS and start using competitors like Microsoft Azure or Google Cloud — or else. Kroger, too, recently discussed its intention to avoid AWS altogether. In other words, Amazon spent $13.7 billion — just slightly more than the $13.2 billion Google spent on Motorola in 2011 — and managed to cause upheaval across the grocery retail sector, the major superstore chains, and even enterprise IT. It's a mark of how seriously corporate America now takes Amazon: When Amazon acts, the world reacts. And as we enter 2018, it's becoming clear that either you're against Amazon or, eventually, you might just become part of Amazon.